Reg Saunders tells the little-known story of the first Aboriginal Australian to become an officer in the army, retelling in an action-packed graphic format. Reg Saunders MBE (1920-1990) not only survived the World War II battlefields in the Middle East, North Africa, Greece, Crete and New Guinea, but excelled as a military leader. He was recommended for officer training and, in 1944, returned to New Guinea as a platoon commander - the first Aboriginal Australian to serve as a commissioned officer. What happened during the war transformed a determined young man from country Victoria into a war hero - one who would go on to serve with distinction in the Korean War, and become a pioneering figure for Aboriginal rights. 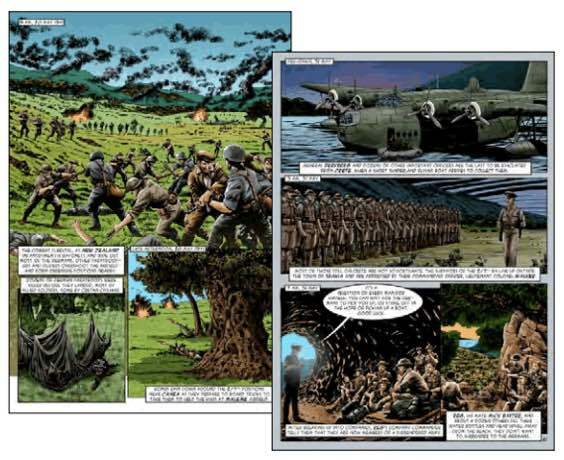 'Reg Saunders' is a book using comic strips to tell history.